Is The Marina & The Diamonds Album Any Good? Marina Diamandis otherwise known as Marina & The Diamonds has been tipped for the top in 2010 with a BRIT award nomination in the Critics’ Choice category and finishing second in the BBC Sound Of 2010 poll – not too much pressure then! 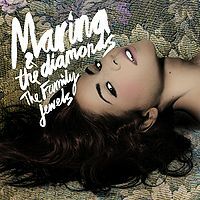 Marina released her debut album ‘The Family Jewels’ today. But is it any good? It all kicks off with the glorious ‘Are You Satisfied’ and ‘Shampain’, which appear to question and deconstruct celebrity and the associated lifestyle. ‘I Am Not A Robot’ was originally featured on an EP called ‘The Crown Jewels’ released in June 2009… it’s an infectious, well crafted track and has one of the finest vocal on the whole album. ‘Mowgli’s Road’ is by far the most unique track on the album purely for its wildness and quirkiness – from the ‘cuckoo’ to monkey noises – it’s glorious. It’s followed by the second best track on the album ‘Obsessions’, which begins as a touching piano led ballad before building to showcase some very fine layered vocals before changing pace again before coming to an unexpected stop. Current single ‘Hollywood’, the first official release from the album is ace – the video which you can see below is grreat too!‘The Outsider’ is just terrific, ‘Hermit The Frog’ is weird but ultimately charming, ‘Oh No!’ has a brilliant shouty chant chorus about staying true to yourself before switching to the fragile and broken sounds of ‘Rootless’.